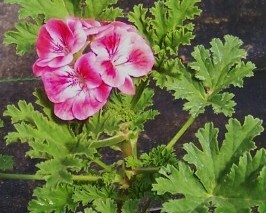 Apricot Scented Geranium (p. scabrum m. ninon) - Dark green divided leaves have a pleasant fruity scent. Large beautiful clusters of pink/white flowers when in bloom. Upright stiff growth habit, makes a nice container plant. Culinary. Zones 10-11+ Live starter plant in 3 inch container.